If you’re looking for an over 55 community that is nestled in a serene lakeside setting, offers easy access to aquatic activities, and is also close to world-renown attractions, then Lake Griffin Harbor is the perfect choice. We are situated in picturesque Leesburg, Florida, in the heart of the beautiful Chain of Lakes region, known for its rolling hills and tranquil beauty. 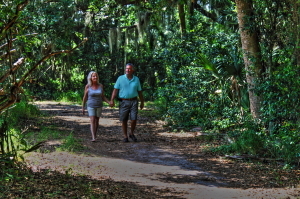 It’s the ideal environment for you to live and enjoy resort-style Florida living on a retirement budget. Our 55-slip marina is a perfect spot for housing your recreational watercraft, but if you choose to store it elsewhere, you can launch it directly from our on-site boat ramp. And be sure to bring your fishing gear, because the bass fishing on Lake Griffin is legendary. In fact, Lake Griffin in Leesburg, FL, is home to trophy bass fishing tournaments, and true lunkers are frequently pulled from its depths. After you land your trophy-worthy fish, you can have it mounted and displayed in your affordable, comfortable, low-maintenance home inside our gated, over 55 community. We have two- and three-bedroom units available, all of which feature vinyl windows and siding for easy cleaning, central air conditioning and heating for those rare moments when you are sitting inside, and two bathrooms for the times when the children and grandchildren come to visit. We even have empty lots available if you choose to build the retirement home of your dreams. Contact one of our friendly Lifestyle Consultants today to learn more about the Lake Griffin Harbor over 55 community, or to ask any questions you may have about the Leesburg, FL, area. We’re happy to help you transition into your affordable Florida retirement lifestyle. © Copyright 2019 Lake Griffin Harbor. All rights reserved.